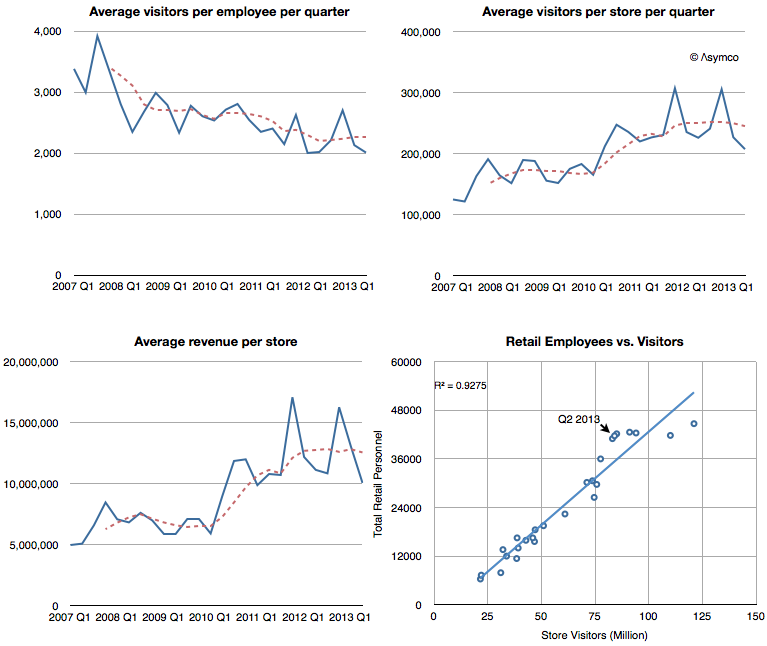 Visitors per employee,Visitors per store, Revenues per store and Employees correlated with Visitors. The pattern that seems to appear is one of a plateau or peaking of sales, especially when values are seen on a per-store basis. Revenues, employment and visitors per store are all flat or slightly down when seen on a seasonally adjusted basis (trailing four period average). 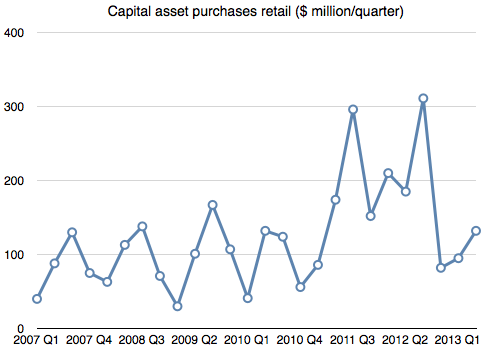 Profitability has been more steady over a long period, though more volatile in a short-term window. Seen in isolation, Apple Stores would appear to be coming to a point of quiescence. But they should not be seen in isolation. 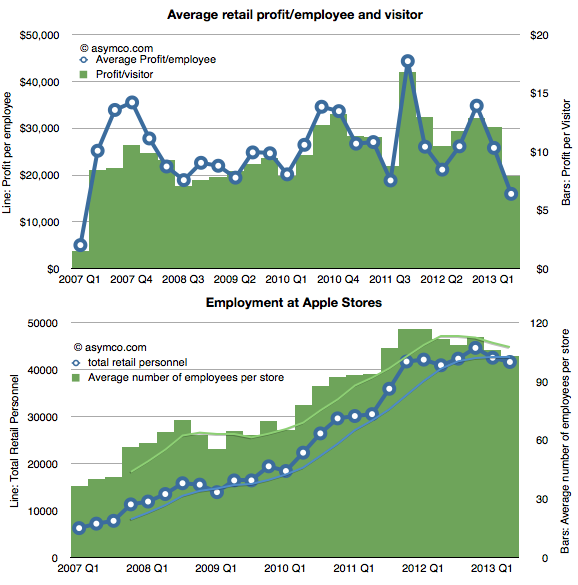 Apple Stores mainly sell Apple products, so if Apple products slow then retail sales should also slow. 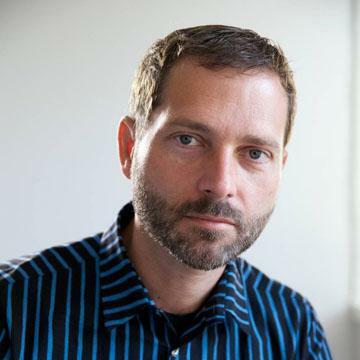 Indeed, in 2007 Steve Jobs told Fortune that the Apple stores had been built to sell the iPhone and in 2010 Ron Johnson said the Apple stores had been built to sell the iPad. These statements were meant metaphorically but they are literally true when looking at what is actually sold. 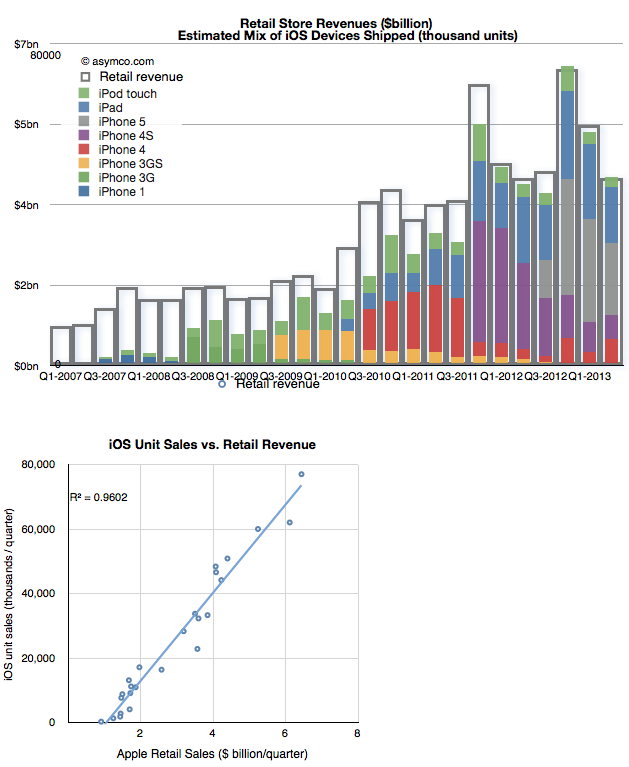 The following graph shows the relationship between iOS device sales and Retail revenues. The first chart shows the relationship plainly enough and the r-squared coefficient of 0.96 puts a finer point on it. So at the end of the day, the performance of the Apple stores depends on the performance of Apple’s portfolio of products. It stands to reason that as iOS units slow, Apple stores should as well.